In 1955, Poul Rahbek Hansen set up Rahbekfisk in Denmark on the harbour in the town of Fredericia. His idea was to benefit from the easy access to fresh seafood, making it easier for consumers to enjoy delicious fish dishes. This strategy has secured the present position as one of Europe's largest producers of frozen, mainly fish-based, convenience products. Rahbekfisk employs nearly 300 people at its facilities in Fredericia and Hirtshals, Denmark. The Rahbek series is very important to us. With that we wish to set new standards for frozen foods and rise above the bad reputation of frozen, ready-made dishes. The idea is simple: we want to focus on quality raw ingredients, food quality and innovation in order to create tasty products, which are easy for consumers to prepare – and delicious to eat. The focus is on great taste sensations, and the taste speaks for itself. Hence our motto: – Taste for yourself! The series includes both new products and well-known classics in new and improved versions. All products are tested as Superproducts by a panel of consumers in Superavisen on 20 October 2002. 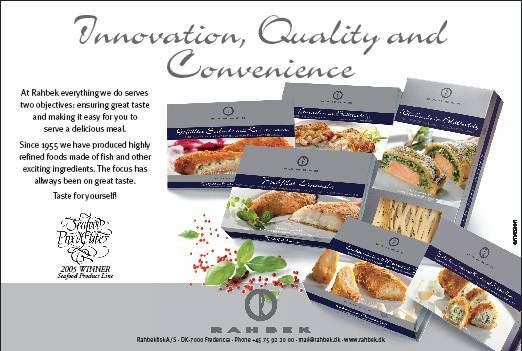 In 2003, the Rahbek series packaging won gold in the international Mobius Design Awards. 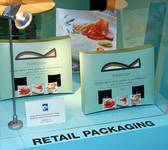 Rahbek obtained the award for the Best Retail Packaging Product at the European Seafood Exposition 22-24 April 2008 in Brussels. At the Fourth Open SEAFOODplus Conference 5-6 June 2007 in Bilbao, Spain, the Certificate of Associate Membership was presented to Mr. Nicolai Hansen of the Rahbek company.